The Air Force community, including hundreds of special operators, gathers at the Air Force Memorial to witness the unveiling of Master Sgt. John Chapman's name on the Wall of Honor as a Medal of Honor recipient. More than 600 airmen gathered with Air Force leaders at the Air Force Memorial near the Pentagon in Arlington, Virginia, Friday morning to honor fallen combat controller Tech Sgt. John Chapman. Air Force Secretary Heather Wilson, Chief of Staff Gen. David Goldfein and Chief Master Sgt. of the Air Force Kaleth Wright all spoke before unveiling Chapman’s name on the Wall of Honor. This week, Chapman became the first airman since the Vietnam War — and the first Air Force special tactics operator ever — to earn the Medal of Honor. He received the nation’s highest award for valor for his actions during the Battle of Takur Ghar, also known as Roberts Ridge, in Afghanistan in March 2002. Tech. Sgt. John Chapman, the combat controller who was killed trying to save the lives of a team of Army Rangers during a ferocious Afghanistan battle in 2002, was posthumously awarded the Medal of Honor Wednesday. “This is a historic week for the Air Force and the special operations community,” Wright said during the ceremony. “Believe it or not, he is the first special tactics airman to receive the Medal of Honor. And although there have been 60 Medals of Honor presented to airmen from World War I, World War II, Korea and Vietnam, John is only the fourth enlisted airman to receive this recognition since the Air Force became its own service." Col. (ret.) John Carney, considered the father of Air Force special tactics, gets emotional as he speaks during Tech. Sgt. John Chapman’s name unveiling ceremony at the Air Force Memorial, in Arlington, Va., Aug. 24, 2018. 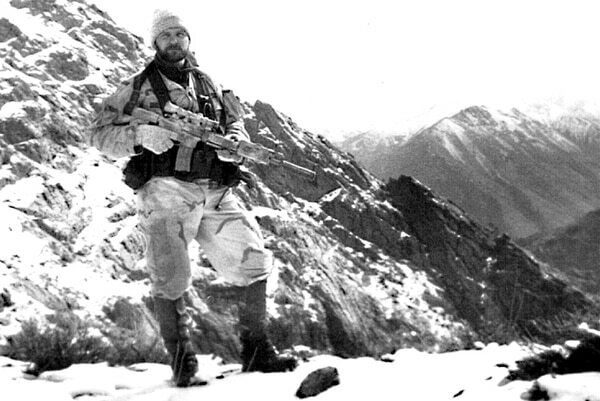 Chapman was posthumously awarded the Medal of Honor for actions on Takur Ghar mountain in Afghanistan on March 4, 2002. Chapman was also posthumously promoted to the rank of master sergeant following a flyover of Air Force Special Operations aircraft — to include AC-130 gunships — at the ceremony. During the event, Goldfein recounted the role Chapman’s widow continues to play for members of the Air Force special tactics community. “In August 2011, shortly after I became the [commander] of U.S. Air Forces Central Command, we lost a helicopter — call sign Extortion 17 — that was shot down carrying a Naval Special Warfare team, several Afghan soldiers, Army aviators and three members of the 24th Special Tactics Squadron,” Goldfein said. On board were Air Force Tech Sgts. Daniel Zerbe and John Brown, both pararescue jumpers, and Staff Sgt. Andrew Harvell, a combat controller . Nessel gave a short address at the ceremony, asking the attendees to remember the other U.S. service members who also died at the Battle of Takur Ghar alongside her husband. “I know that if John were here, he’d attest that all the men on the mountain that day were heroes: Petty Officer 1st Class Neil Roberts, Senior Airman Jason Cunningham, Cpl. Matthew Commons, Sgt. Bradley Crose, Sgt. Phillip Svitak and Spc. Marc Anderson," she said. The father of Air Force special tactics, Col. John Carney Jr., also spoke at the ceremony. Carney was selected in 1977 to form the first Air Force special tactics squadron from existing combat control and pararescue airmen. Carney traced the history of Air Force special tactics in his speech, from the failed Desert One mission to end the Iranian Hostage Crisis, to Operation Just Cause in Panama and the First Gulf War, as well as other operations that have yet to be named to the public. He said Chapman represented the culmination of the training and selection requirements put in place after the lessons learned from both those failed and successful operations. Now, Chapman’s own narrative adds to the special tactics community’s legacy and training doctrine for new recruits. “Young airmen of the future will learn of John’s saga, and benefit greatly from his story.” Carney said. As the ceremony closed, Air Force special tactics operators led visitors in “memorial pushups," a tradition in which the names of fallen operators are called out in unison while pushups are conducted in cadence.